The Smoothwall provides you with a proxy to manage FTP traffic. You can choose to configure non-transparent or transparent proxying. You must allow access to the FTP port through the Smoothwall firewall. 1. Go to Network > Firewall > Smoothwall access. 2. Add an access rule for the following Services — FTP proxy (2121). Tip: Alternatively, you can use port 21 (FTP proxy (alternative) (21)) if required by your network. Although the Smoothwall access page also allows you to add both Services to same access rule, it is recommended you use only one for the FTP proxy service. For a detailed description of using access rules, including how to configure them, see Configuring Smoothwall Access Rules. 1. Go to Services > Proxies > FTP. • Status — Select Enabled to enable the FTP proxy. • Anti-malware scanning — Select to scan files for malware. Note: For performance reasons, files larger than 100 MB are not scanned for malware. • Proxy port — From the drop-down list, select the port for FTP traffic. 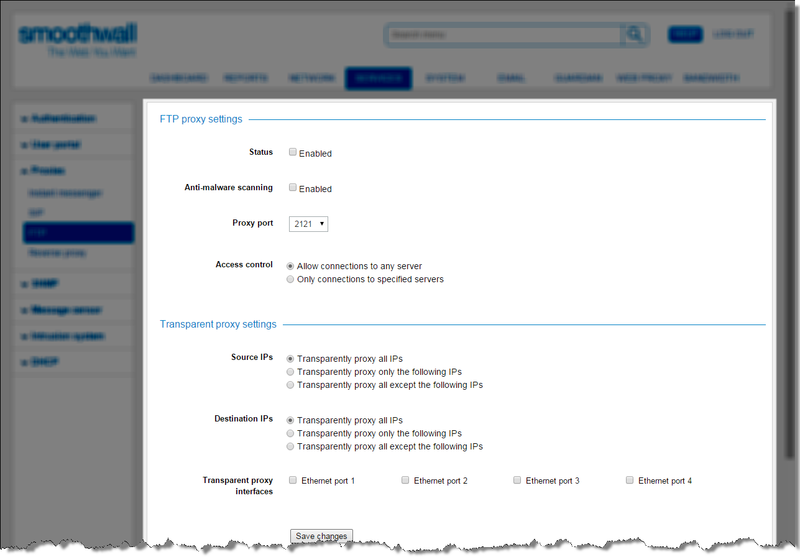 The port you select must be the same one opened for the FTP proxy in the Smoothwall access page — see Prerequisites. • Access control — Choose whether to allow FTP connections to all servers (Allow connections to any server), or only to specific servers (Only connections to specified servers). 3. Click Save changes to save the settings and enable non-transparent FTP proxying. • Remote host — Enter the Smoothwall’s hostname or IP address. • Remote port — Enter the FTP proxy port configured on the Smoothwall, either 21 or 2121. This must match the port number selected for Proxy port. The port you select must be open for the FTP client. You configure this in Network > Firewall > Smoothwall access — see Configuring Smoothwall Access Rules. • Access control — Choose whether to allow remote FTP connections to all servers (Allow connections to any server), or only to specific servers (Only connections to specified servers). If no servers are listed, all hostnames on all ports are accessible. Select to transparently FTP proxy for all source IPs. Select to transparently FTP proxy for the source IPs specified. Enter the IP addresses of local machines which are to be allowed access to transparent FTP proxying. Select to transparently FTP proxy all except the source IPs specified. Enter the IP addresses of local machines which are to be excluded from transparent FTP proxying. Select to transparently FTP proxy for all destination IPs. Select to transparently FTP proxy for the destination IPs specified. Enter the IP addresses of the machines which are to be allowed access to transparent FTP proxying. Select to transparently FTP proxy all except the destination IPs specified. Enter the IP addresses of the machines which are to be excluded from transparent FTP proxying. • Transparent proxy interfaces — Select the interface on which to transparently proxy FTP traffic. 4. Click Save changes to save the settings and enable transparent FTP proxying. When running the Smoothwall’s FTP proxy in transparent mode, you do not need to configure FTP client applications.